All transactions are safe and secure with a reliable history in online purchasing behind each of our associates. 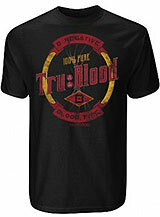 Buy the Tru Blood t-shirt to own True Blood clothing and merchandise. This classic black tee features the label from the Tru Blood beverage that inspired the hit HBO series True Blood. While this synthetic blood beverage is a favorite of Bon Temps vampire Bill Compton, some more discerning palates, like that of Fangtasia vampire club owner Eric Northman (Alexander Skarsgard), find it metallic tasting. The human version available is a delightful sparkling blood orange soda that has inspired many vampire themed cocktails. While it may not be real blood, this is as good as it gets. Grab a True Blood t-shirt today. In addition to the Tru Blood tee above, browse the True Blood Clothing Gallery for more apparel like men's and women's clothes, kids shirts or hoodies.